Solar panels shining in the sunshine are a symbol of all things green. They’re effective, reliable, reasonably unobtrusive and this carbon-neutral energy source offers hope for a world free of fossil fuel burning pollution. However, when you start to examine the finer details of solar energy production there are, unfortunately, a number of adverse side-effects associated with it. Firstly, where you aware that many of the solar panels installed on rooftops in Europe and the US have left behind a legacy of toxic pollution in rural China? This is happening because a number of the factories manufacturing polysilicon are not installing effective pollution-control equipment and are simply dumping toxic waste directly into the countryside. Polysilicon is a key component of the sunlight-capturing materials used in solar photovoltaic (PV) cells, and ultimately solar panels, and China is one of the global leaders in solar PV manufacture. Although solar PV manufacture is by far the most commonly discussed negative side of solar energy (because of the hazardous materials needed to build them and open mining involved), there’s another, unspoken side-effect of solar energy production that’s conveniently swept under the table by the solar energy operators, namely water usage. This is particularly damaging to the reputation of the solar energy industry and eco-friendly beliefs it stands for. Power obtained from the sun should be the most sustainable energy source of all. However, because most of the industrial-scale solar farms are situated in hot, arid climates, these solar arrays need to be kept clean to perform optimally. This equates to millions of gallons of water being sprayed over them, leaving the people who live there with highly depleted water source crucial to their very existence. Take India for example. Its solar energy market is booming, and its Government has ambitious plans to grow its renewable energy capacity to more than 175 GW over the next five years. Large-scale photovoltaic (PV) Installations in the deserts of Nevada and California also face a number of water challenges, and many developers seem to be creative with the facts when it comes to water consumption, claiming that solar PV installations consume significantly less water than wet cooled solar thermal installations (approx 16,689k gallons per MW versus 2.6M per MW). Nevertheless, a large PV array can still easily consume more water annually than an entire residential block and both types of installations are depleting the region’s most critical natural resource. For solar power to be truly sustainable you need to eliminate or massively reduce the need to clean solar PV modules in the first place; something that’s currently not an option because dirty modules are not efficient and power output can be reduced by as much as 20%, making solar energy production less economically viable than fossil fuel (as ironic as that seems). There could be a solution to the water quandary in solar energy on the horizon though, thanks to pioneering R&D being carried out by UK company, Opus Materials Technology. The company has secured over £4m in EU funding and is working with a consortium of academics and scientists to develop a dirt-repellent coating (Solar Sharcâ ) based on cutting edge nanotechnology to eliminate the colossal water-consumption needs of large solar farms. 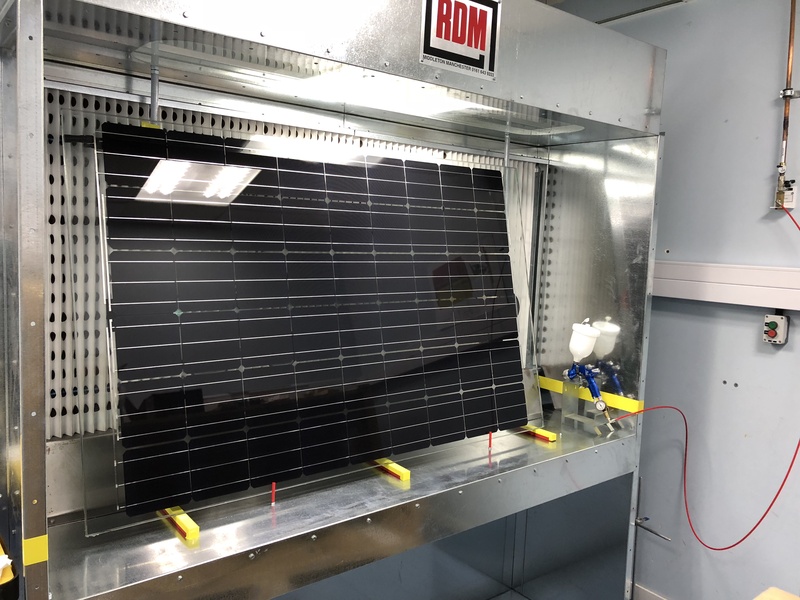 EPC regulation in the UK stipulates that solar modules must be regularly maintained, and research suggests PVs must be cleaned at least twice a year. A dirt-repellent coating could dramatically reduce, even eliminate these cleaning needs. For domestic applications (with 4kWp modules or less), cleaning costs are around £6 per square meter. For large-scale installations with 50kWp systems, the cleaning cost are £2.00/m2 (equivalent to £3.15 per panel), excluding labour costs, access to specialist cleaning equipment and other hidden O & M costs. Trials conducted by a consortium member (Above Surveying Ltd) have also demonstrated that a PV module installed in a UK location at a 15-degree tilt and not cleaned for a 12 month period revealed significant dirt accumulations at the bottom of the module, provoking a thermal gradient, and consequently a deleterious impact on the power output. Extensive field trials are underway globally and once completed, Solar Sharcâ could change the face of solar energy production as we know it and cleaning would become a thing of the past.